Hooray for Halloween, the night where we get to be as bloodthirsty as we want without being reported to the police as a person of suspicious nature. The Creative Assembly are embracing the evening too by bringing a new DLC pack to Rome 2 that drenches it with the crimson liquid. Forget those less-than-dramatic death animations and bring on mass decapitation. Whilst most horror-themed packs are only good for one night of the year, The Creative Assembly have wisely opted to not included a legion of zombies or ghosts in Rome 2, but just revel in the gritty violence of the Roman period. 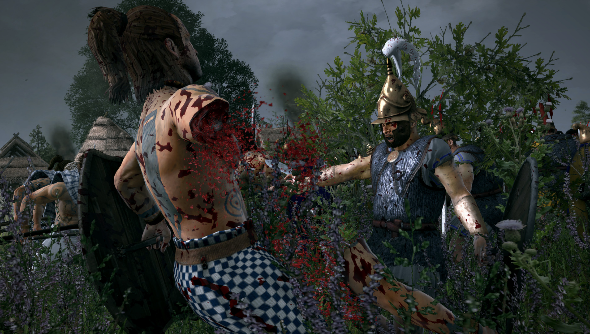 The Blood and Gore pack brings the horror of close combat to the battlefield sections of Rome 2, with every arrow, every spear and every sword offering notable and visceral impact on enemy troops. Injuries will spurt blood which will paint the landscape red, and deaths can come via the means of decapitation or dismemberment. Lovely. The Blood and Gore DLC pack for Rome 2 is available on Steam now and will set you back £1.99, and will keep your disgusting fetish fed for a campaign life-time.